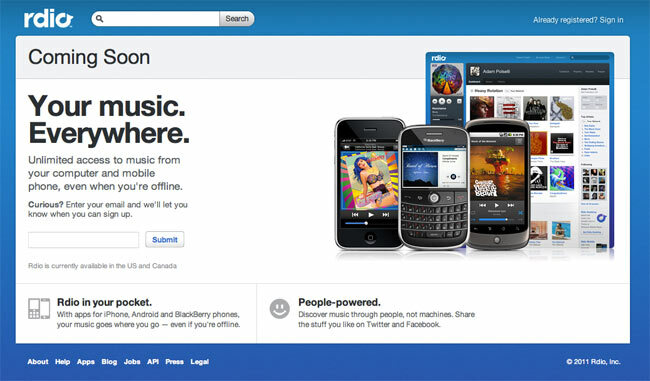 Rdio the US provider of unlimited access to music from your computer and mobile phone, even when you’re offline. Has now released developer API’s to help it get the jump on its competitor Spotify before it arrives in the US. Rdio is now allowing developers to use their new API’s to create new ways for people to discover, collect, share and play music via Rdio and in the process gain a more secure footing in the US market. The new API’s have already been installed on a few select services including AOL’s new Play app for Android devices and the Grammy’s MusicIsLifeIsMusic site. As well as new API’s Rdio has also now launched an affiliate program that will give affiliates a 2-3% commission per month per subscriber for as long as they remain an Rdio user.